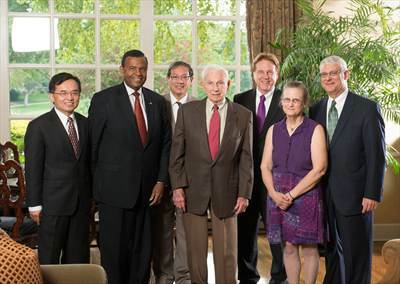 Pictured, from left: Institute Executive Director Michael Song, UMKC Chancellor Leo Morton, Bloch School Dean Teng-Kee Tan, Bloch School benefactor Henry W. Bloch, FAIA ACSA Distinguished Professor Victor Regnier (University of Southern California School of Architecture), Catherine Regnier and President and CEO, Bank of Blue Valley, Robert Regnier. The University of Missouri-Kansas City and the Henry W. Bloch School of Management have received a $3 million gift from the Regnier Family Foundations to endow the Regnier Institute for Entrepreneurship and Innovation, housed in the Bloch School. The foundations were established in 1990 by Victor A., Jr., Robert D. and Catherine M. Regnier to honor their parents’ legacy. The Foundations established for Victor L. and Helen Benning Regnier promotes higher education, children’s programs and libraries, primarily in the Kansas City area. The UMKC gift will provide an opportunity for more students to apply to the Institute’s nationally and globally ranked entrepreneurship programs offered through the Bloch School. The Regniers have been long-time supporters of the Institute, having named the Institute’s Venture Creation Challenge event (Regnier Venture Creation Challenge) with an annual gift in 2007. The Challenge is designed to encourage student venture creation through a forum in which students can present new venture concepts to local investors, business leaders and entrepreneurs. Throughout the year, UMKC students develop business plans supporting commercialization of high-growth-potential technologies as well as their own original ventures. These student teams compete in the Challenge for various awards. Several of the student ventures have achieved initial success. Tim Sylvester’s Integrated Roadways, featured in The Wall Street Journal, created sensors to detect hazardous road conditions, using a modular pavement system. Shane Spencer’s Green REIT – a real estate investment trust focused exclusively on renewable energy – secured nine figures in investment in his first year and made Forbes’ 30 under 30 in Real Estate list. Kristen Kenney, an alumna of the UMKC Law School, won a University of Missouri System award for RE:Cite, which helps make legal services more profitable for practitioners and more cost-effective for consumers. The product has an addressable market value of more than $800 million. “The Regnier Family understands the significance of this experiential learning challenge as well as the quality of the entrepreneurship programs at the Bloch School,” said UMKC Chancellor Leo E. Morton. The Institute for Entrepreneurship and Innovation develops and delivers UMKC’s entrepreneurship offerings, including the Bloch School’s degree programs at all levels and cross-disciplinary programs university-wide. Visit the Regnier Institute for Entrepreneurship and Innovation. More about Bloch School Rankings. This entry was posted in Alumni and Friends, Archives, Events by . Bookmark the permalink. This is great! I’m so glad to see the Institute have a new name.